El Alamein (Historical Photograph Edition) is a game by Atsuo Yoshizawa, distributed by Japanime Games. It is for 2-5 players. In this sequel to Barbarossa, players move their forces from Russia to Africa as they attempt to defeat the British Army’s main stronghold in Cairo and then their last line of defense in Alexandria. This is both a stand alone game as well as an expansion that can be combined with Barbarossa. It adds lots of new cards as well as a few new rules regarding combat and retaliation from the British Army. For more information on Barbarossa and how to play it, please follow the link below. It should be noted that this game adds a new type of card, Victory cards. These will be discussed in more detail in just a bit. To begin, the Supply cards, Strategy cards and Army cards should be separated and placed into their own individual piles face up. Support cards, Event cards, City cards and Victory cards should be placed in separate piles from the previous ones. These card types should each be shuffled separately, except for the City cards. They should be sorted by their City number and placed in a pile with the smallest City number on top. Each type of card should then be placed in rows according to their Supply cost in the middle of the play area. The Event cards and Victory cards are placed face down, while everything else is face up. It should be noted that there are 2 types of Panzer Regiment cards. These should be set up so that the (III) cards are on top of the (IV) cards. For more information and a detail diagram on how this should all look, please check the rulebook. 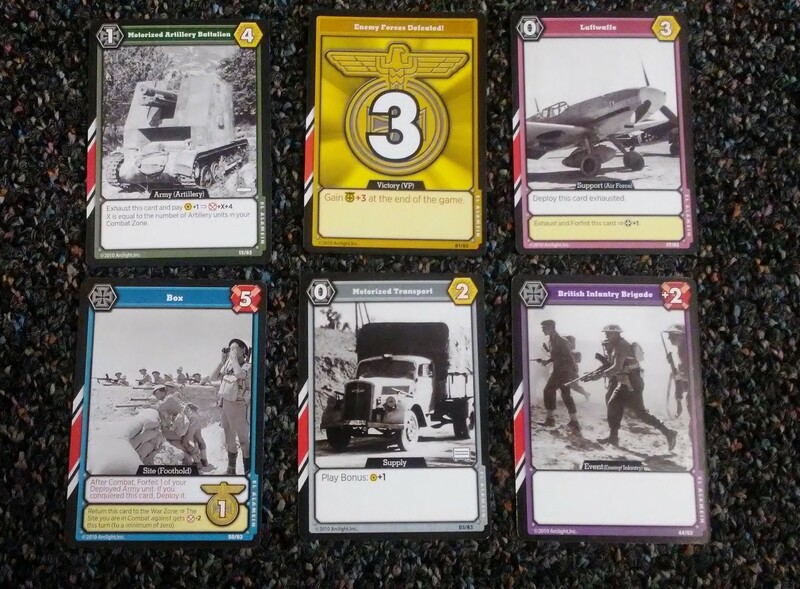 Each player is given 6 Motorized Transport cards and 2 Italian Infantry Regiment cards, which they will shuffle together to form their starting deck. Each player draws the top 4 cards of their deck. As you can see, there are a few minor changes in the way the game is set up. From here, the first player is chosen and play now begins. Just like in Barbarossa, the players will follow the same 4 phases during their turn. For more information on the step by step details of a player’s turn, please check out the link above. As I’ve mentioned earlier, there are several changes and additions to the rules which I’ll discuss now. One new item of note is that this game introduces the new Victory cards. These cards are gained when a player takes a City and are the main way that players score points in the game. When these are gained, they are immediately deployed activating any effects that the card might have. Of course taking a City can only be done through combat. Speaking of combat, this has actually had several new changes to the rules that we first saw in Barbarossa. However, just like in Barbarossa, combat can be initiated only once during the player’s Tactics Phase. Combat follows a series of steps. First the player msut declare combat by having at least 1 army card deployed. Next they choose a Site card to attack, either a Box card from the Site deck or the top card of the City deck. If the player chooses a City card to attack, they must then flip over a number of Event cards equal to the City card’s Garrison value. The player then must resolve the red text on each card as they are revealed. If the player attacked a City, they must then send a number of cards equal to the City’s reinforcement value from the Event deck to the British Reinforcement stack. Players are not allowed to look at these cards. The player is then allowed to activate any abilities from cards they have deployed. They can also use Supply cards or other cards from their hand that have the combat ability on them. Any destroyed Event cards are then exhausted to show this. Any Event cards that were not destroyed will then add their defense value to that of the City’s defense value. If the player chose to attack a Box, then there are no Event cards used. That means that it’s defense value does not change. Next the player must pay attack points greater than or equal to the total defense value of the chosen card they are attacking. If they’re able to pay the cost, then the attack succeeds. If not, they lose. If the player wins, they gain the defeated Site card and activate it’s abilities. First off they must choose a number of Army units from those they have deployed that are equal to the battle damage value of the City card. These cards must then be discarded. The player then draws and deploys a number of cards from the Victory card deck equal to the Victory Point value of the City card. Next if any of the Event cards that were revealed have effects when they’re acquired, then these effects take place now. If the player loses the combat, the effects of the Site card still activate even though the card is not acquired. The player must also discard a number of deployed Army units equal to the battle damage value of the City card. Once this is taken care of the player may activate any abilities from played or deployed cards, or if they have a playable card in their hand, they may play it now. After this is done, any remaining Event cards from those that were revealed are placed at the bottom of the Event deck. Earlier I mentioned that in this game there is a way for the British Army to retaliate. This is known as the British Counterattack turn. A British Counterattack turn happens if one of the Event cards revealed during the attack of a City is a British Counterattack card, or if the player defeats the El Alamein card. This counter attack happens after the player’s turn ends and before the next player’s turn begins. Once the Counterattack begins, it continues until all the counter attacking forces have beend destroyed or there are no more players left to intercept them. The British Counterattack follows a series of steps, just like regular combat. First all of the Event cards in the British Reinforcements stack are revealed. Only card type and sub type are important on these cards, everything else is ignored. Next the order in which players will intercept the counter attackers is determined. First the player that triggered the counter attack will go first. After that, any player that has at least 1 City card deployed goes next based on the number of the City deployed. The higher City goes first. Players who have no City cards deployed will not have to face any counterattack forces. Once the order is determined, the players will intercept the counterattack by following a few steps. Each time, they will determine if the Counterattack continues or is stopped. First the player checks to see if all of the Counterattack forces have been destroyed. If so, then the Counterattack ends and the players have won. If all the designated players have already been targeted, then the counterattack can also end this way. However if neither of these conditions have been met, then the British Counterattack Turn continues by moving to the next designated player. If the Counterattack is ending, then any remaining cards in the War Zone of the Counterattacker’s forces are placed on the bottom of the Event deck and the next player in turn order begins their turn. However, if the Counterattack is continuing, then the attack simply moves to the next player. Earlier I mentioned that another player might be able to intercept the Counterattack. In a lot of ways, interception mimics combat with a few differences. First the player is able to activate any abilities of cards in their Combat Zone. They can also play cards that can be played while intercepting. It should be noted however that Attack points serve no purpose in intercepting, so effects that give these points are useless at this time. Next, the player that is intercepting declares allotment. What that means is they choose at least 1 of their deployed army cards that has an interception rating on it for each Counterattacking Forces card that have not already been destroyed. The higher the number the more Counterattacking Forces cards that may be allotted to. Once this is done, the actual Interception is done. Each paired card is handled as follows. If it’s a Counterattacking Forces card that has an army unit alloted to it, it’s destroyed. The card is exhausted to show this status. If it’s an army card that has been allotted to a Counterattacking Forces card, it is Forfeited and sent to the players discard pile. Once each paired up card has been resolved, the player has the option to activate abilities and play cards just like before. The results are then checked. If the Counterattacking Forces have all be destoyed, then the interception is a success. If not, then it was a failure. If it succeeded, nothing happens. However if it failed, then intercepting player must return the highest numbered City card they have deployed to the top of the City stack. They must then return a number of Victory cards equal to the City card’s Penalty Value that they just returned. These Victory cards are chosen at random and are placed at the bottom of the Victory Card deck. This happens for each player that can intercept until the Counterattack is stopped as discussed earlier. The game continues until one of two things happens. If a player acquires the Alexandria City card, then the game ends after their Tactics phase. Likewise, if at the end of a player’s Tactics phase, there are no more Victory Point cards in the stack, then the game ends. Players add up all the Victory Points from their deck, discard pile, hand and Combat Zone. Players compare points and the player with the most Victory Points is the winner. Just like Barbarossa, this game contains a box full of cards. They are really great quality and the photos used for this edition are just as nice. There are photos of people, equipment and weaponry from World War II that will really draw you in. History buffs like myself will be very pleased with the overall look and feel of each card. Again the iconography is a bit difficult to understand for new players but seasoned veterans of Barbarossa shouldn’t have any real problems. There’s a great thematic feel to this set, just like there was with the original. Overall I really like the look and feel of this set, probably even more so than the original. It looks really great and is one that will be a highlight to any collection. Just like the rulebook for Barbarossa, this one is also designed in much the same way. It’s the length and width of the cardboard box that it comes in and is only printed in black and white. There is no color. There are however lots of great pictures and examples including a 3 page look at combat and a British counterattack. There’s a nice reference that explains all the symbols used in the game as well as explanations for some of the new terms and codes that appear in this set. Each of the different card types are covered in great detail with pictures. The step by step process of each of the phases of gameplay are also covered really well. I must also mention that this book has grayed out text boxes that highlight rule changes and additions for this set that aren’t in the rulebook for Barbarossa. There’s also a nice explanation of how to combine this set with the Barbarossa set as well. Overall, there’s nothing really difficult to read or understand. It’s a great reference book and everything is easy to find. My only complaint would be that I wish that it had been in color. Other than that, it’s quite nice. As I mentioned in my original review for Barbarossa, this game has a lot of similar mechanics with Dominion and Tanto Cuore. If you’re familiar with those games then this won’t be too much of a leap for you. I will say that there are several new mechanics and features that kind of turn everything on it’s head though. As I’ve noted in the overiew there’s combat and a British Counterattack turn that makes this game fairly aggressive. If you enjoyed the first game with Barbarossa but felt it was lacking a bit and not warlike enough, then this one will most definitely fill that void. I’m kind of back and forth on this aspect. While I really enjoy a great deck builder, I’m not usually too keen on attacking and defending. To me that makes things a bit too much like a war game and as we all know, I’m not a fan of war games. That said, it’s not that bad. It actually adds a bit of flavor and theme to an already interesting game. I really like the look of this version of the game, not that anime style artwork isn’t nice. It is, but the historian in me simply adores the look that this version applies to the cards. I like the extra addition of the Victory Point cards as well. They add another layer to the game as well. I know it sounds like there’s a lot to keep up with, but it’s not that bad. You will get used to it after a few plays, especially the iconography. History buffs and fans of Dominion or Tanto Cuore should enjoy this one. Barbarossa fans, especially those players that were looking for a little more depth to the gameplay, should love this one. I really enjoy it. I can’t decide just yet if I like it more or less than the original. So for now, I’d rate it about the same. I highly recommend this one. 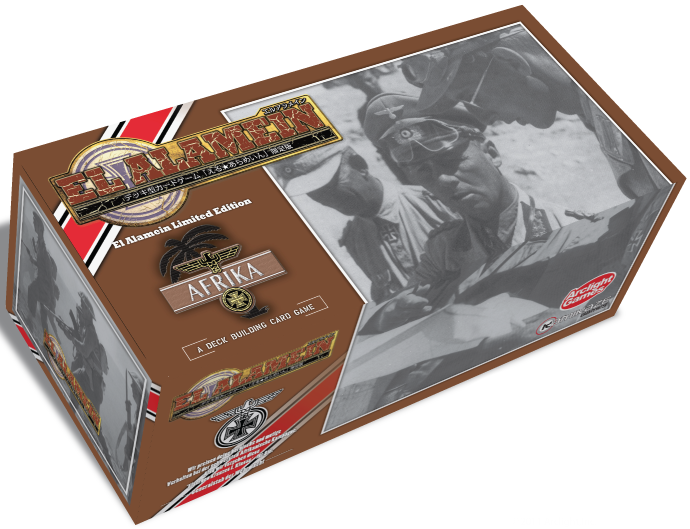 El Alamein (Historical Photograph Edition) is a deck building card game that is both a self contained game, as well as an expansion for Barbarossa. The game does take a little bit longer to play. Most game sessions last a little over an hour or so. Just like Barbarossa, the cards in this one look amazing. I really love the historic photographs and the design is really nice. The pictures really add to the theme of the game. The game adds a bit more as far as gameplay goes, which also adds a bit of complexity to it. For players that struggled with Barbarossa, this might not be the game for you. Those players that enjoyed Barbarossa should really love this one as well. It adds quite a bit more to an already great game. Dominion and Tanto Cuore fans will most likely enjoy this one too as it replicates a lot of the same mechanics. If you don’t like conflict in your deck builder, then you might not like this one. For me, I’m good with it. It makes the theme feel a bit more real and adds a bit more depth to the gameplay. I especially like that it can be mixed with Barbarossa to add even more replayability. I highly recommend this one. It’s a very solid expansion and a great game by itself. I think you’ll enjoy it. For more information about this and other great games, please check out Japanime Games at their site. This entry was posted in Reviews and tagged alamein, atsuo, Atsuo Yoshizawa, board, board games, card, card games, edition, el, el alamein, games, historical, japanime, japanime games, photograph, yoshizawa. Bookmark the permalink.